Would You Like a Computer to Go With Your Shovelware? The IdeaPad Y570 has so much going for it that it’s hard to know where to start. The specs — similar to the recent Toshiba Satellite P755 — are high-end for a computer that’s priced under $1,000: 15.6-inch LCD (1366×768 pixels), 2.3GHz Core i5, 4GB of RAM, and a 500GB hard drive comprise the basics, and an Nvidia GeForce GT 555M provides more graphical oomph than you’re likely to need. Those graphics, by the way, are switchable: Flip the slider on the front of the Y570 and it powers the GeForce down, letting Intel’s integrated graphics kick in. It makes a difference: With the graphics turned off you’ll get nearly four hours of battery time, even under full brightness and heavy load. Performance is otherwise very good, about average with the usual productivity apps, and quite good with games. 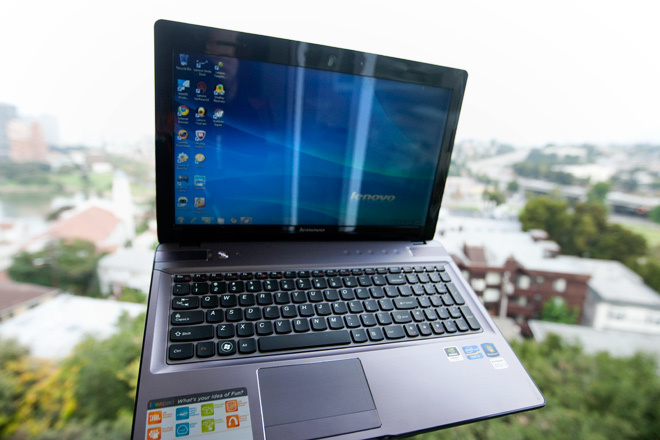 As with the Toshiba P755, the Y570 excels with older titles, and turns in respectable frame rates on newer ones. Designed with entertainment in mind, the Y570 features loud and capable speakers (from JBL) and a crisp, good-looking LCD (though the brightness could be better). But Lenovo takes the consumer focus a bit too far, as evidenced by its preloaded software bar (the Lenovo “Smile Dock”) that drops down from the top of the screen, always when you want it the least, and whose sole purpose is to try to sell you crap. Making matters worse: The computer is absolutely loaded to the gills with shovelware, with 16 icons appearing on the desktop when you boot up for the first time. During setup, hapless users will find themselves inundated with “special offers” for everything from DSL service to a new laptop lock. Horrifyingly, registration is required to actually use the computer for the first time. With four USB ports (two USB 3.0, one eSATA combo), SD card slot, and a full-size HDMI port, the Y570 has all the connectivity you need, but it’s the vast and spacious trackpad that really caught my eye… er, thumb. Wider than the space bar and featuring both a subtle texture and big, easy-to-hit buttons, it’s one of the few laptop touchpads of late I can actually get excited about. I have to unfortunately withhold that love from the keyboard, another trendy, island-style job that’s hard to type on and did nothing for my accuracy. Complaints about crapware and keyboard aside, the Y570 is actually an extremely capable laptop with a solid build and impressive performance. Just let it be noted: Most of us would rather pay an extra 20 bucks up front and get back the time and frustration wasted on uninstalling junk. WIRED Great combination of performance and price. Outstanding battery life from just a six-cell unit. TIRED Hefty at six big pounds. Status lights and buttons above keyboard difficult to make out from a distance of more than eight inches. Don’t have a shovel large enough to get rid of all this preinstalled junk and upsell come-ons. Not sold on the burnt orange trim.